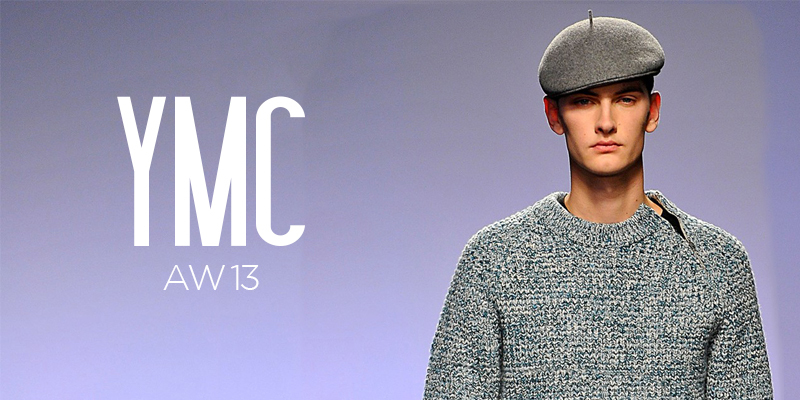 There was a palpable sense of nostalgia in the Autumn Winter 2013 collection from YMC. Designer Fraser Moss took inspiration from the brand's post-punk, 90s roots. The youthful exuberance and frustration that defined the era was represented by the beret, a clear statement piece for the season. The combination of relaxed knitwear and fine tailoring gave the collection an understated cool factor that really embodies the YMC look. Zip detailing and exaggerated pockets on boiler suits and chinos were functional, almost uniform-like. Moss' palette for Autumn/Winter was predominantly black and grey but it was the rich jade tones and brief flashes of pink and red that really brought the collection to life. One of my favourite highlights was a jade green cardigan over a checkerboard print shirt and slate coloured chinos topped with a beret and shades. It just screamed effortless sophistication. There's something really charming about YMC's 'no frills' approach to design, nothing seems just thrown on to distract or shock. The result is a collection that is timeless but contemporary at the same time.